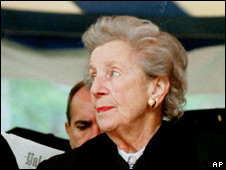 Helen Suzman, a celebrated South African MP and anti-apartheid campaigner, has died at the age of 91. Mrs Suzman, a member of parliament first for the opposition United Party and later the Progressive Party, was an outspoken critic of apartheid. For 13 years, Mrs Suzman, the daughter of Jewish Lithuanian immigrants, was the only MP to openly condemn South Africa's whites-only apartheid regime. She was made an honorary dame by the Queen in 1989. She was also twice-nominated for the Nobel Peace Prize. The family plans to follow a private funeral this weekend with a public memorial in February, the SAPA news agency reported. The former MP, who had been in a frail condition recently, died at her home in Johannesburg early on Thursday. Archbishop Desmond Tutu said his country owed her an enormous debt in the struggle against apartheid. "She really was indomitable," he said. Nelson Mandela Foundation chief executive Achmat Dangor told the Associated Press news agency that she was a "great patriot and a fearless fighter against apartheid". Mrs Suzman, who first entered the South African parliament in 1953, was a thorn in the side of the apartheid regime, says the BBC's Peter Biles, in Johannesburg. She was a frequent visitor of jailed African National Congress (ANC) leader Nelson Mandela when he was held on Robben Island prison for 18 years. 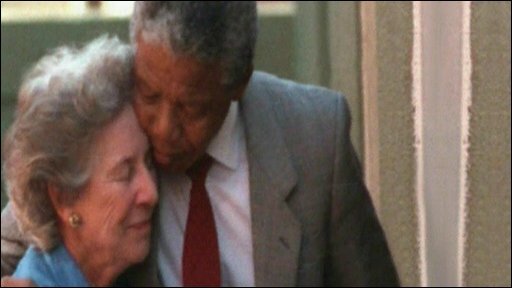 Mr Mandela wrote of her in his biography: "It was an odd and wonderful sight to see this courageous woman peering into our cells and strolling around our courtyard. She was the first and only woman ever to grace our cells." Former President PW Botha once referred to her as a "vicious little cat". For her part, she said that if he were a woman, "he would arrive in parliament on a broomstick". Despite her frailty in recent years, Mrs Suzman, who stepped down from parliament in 1989, continued to speak out against what she saw as the failings of South Africa's post-apartheid ANC administration. Mrs Suzman was born in Germiston, Gauteng, on 7 November 1917 to Jewish Lithuanian immigrants. In 1937, at the age of 19, she married doctor Moses Meyer Suzman. The couple later had two daughters. Mrs Suzman received honorary doctorates from leading universities across the globe, including Oxford, Cambridge, Columbia (New York), Harvard, Witwatersrand and Cape Town. She was also awarded an honorary Fellowship of the London School of Economics (LSE).